Food Processing only has 92 graduates each year, which is lower than average. Graduates typically earn about N/A per year in their early career. Pick one of the top schools in the rankings and give your earning potential a boost. Often a highly ranked school is top in other categories as well. Check out the schools below and see what else makes them stand out. 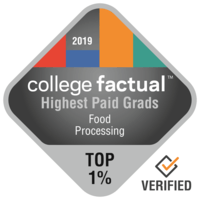 The following rankings are a list of colleges with the highest salaries for Food Processing graduates. Our ranking methodology takes into account Food Processing specific starting and mid-career salaries to find the top paid graduates.